Home » CAL, events, KAL, Yarn Crawl	» Rose City Yarn Crawl Mystery Knit-Along Patterns Now On Sale! The 2015 Rose City Yarn Crawl planners are delighted to announce that, as a part of the 2015 Rose City Yarn Crawl, there will once again be both a Mystery Knit Along AND a Mystery Crochet Along. We’ve teamed up with two fabulous local designers,Debbi Stone (The Stitches of My Life Designs) and Darla J. Fanton (Designs by Darla J) to bring you two sensational shawl designs for this year’s Mystery Along. Two very different and very Portland designs. Presales of patterns have already begun, giving you plenty of time for swatching, color choices, and requesting yarn for the holidays. Both Mystery Alongs will begin in January 2015. 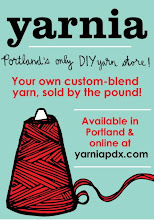 March 5-8: Rose City Yarn Crawl. Wear your shawl! We are recommending the following yarns for each of the mystery -alongs. Be sure to purchase your pattern and your yarn early so you’ll be set! We will be hosting a Knit-and-Crochet Along for both of these patterns at our regular Monday Night gatherings. We’ll get cracking on the first clue on Monday, February 2nd! Rose City Yarn Crawl: Save The Date! 2014 Rose City Yarn Crawl is Coming Up!